Pet Loader - The Safe Way To Put Your Dog Into Your Car. Recommended for dogs up to 68Kg. For giant breeds over 68Kg, please use Pet Loader XL. 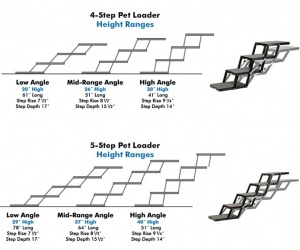 Pet Loader is wider and more stable than a ramp.The lower angle of ascent/decent and greater traction eliminates your dog’s fear of entering the vehicle. Pet Loaders have been hugely popular in the USA for some time but have not been available from any UK retailers until now. Big Dog World is proud to be the sole Pet Loader UK retailer. - Easy to use and easy to store. - No injury to dog or yourself. - Great stability - easily holds the largest dogs. - Incline adjusts to pet and vehicle. - No sag for added assurance. - Level platforms instill confidence: dog instinctively knows how to use it. 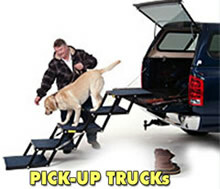 - Ideal for SUVs; pickup trucks and vans. - Endorsed by vets, groomers and trainers. Platform size: 22 inch (56cm) length, 16 inch (40cm) width. Goods were delivered in good time and informed of status of order. 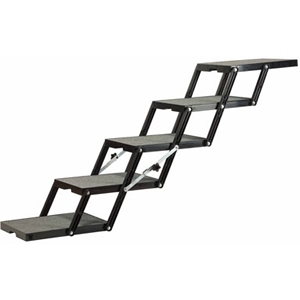 The steps we ordered have proved invaluable and are of good quality. Our puppy learnt to use them immediately even though he wouldn’t tackle stairs. y elderly arthritic dog was getting hurt each time she tried to jump into the car boot and was needing help from me each time. 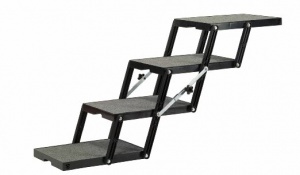 Now these steps are the perfect solution for her and she quickly adapted to using them. Brilliant idea and so much better than a ramp. Very well made and easy to use they have changed our lives and made our excursions fun again. 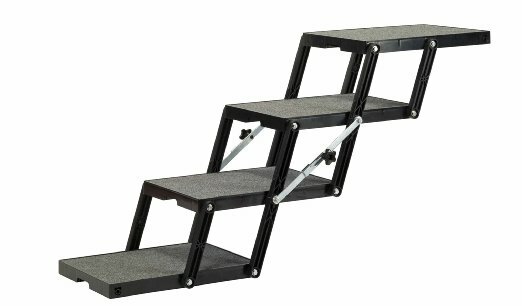 Bought this for my 9 year old bernese mountain dog as he was finding the ramp we have always used difficult. Took to the stairs straight away. Much easier for him to get into the car which has a high tailgate really pleased we bought these. Very sturdy. 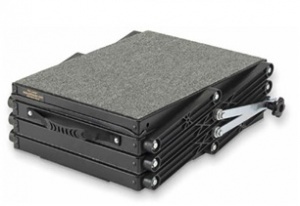 These are very sturdy steps and the most compact option for keeping in the car. The folded steps sit nicely in the footwell of the rear seats. Our 11.5 stone beastie is happy using the steps and needed very little encouragement to climb up the 1st time. 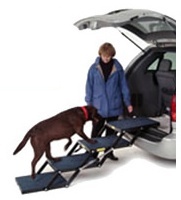 We have previously tried the XL-sized aluminium ramp, and abandoned it as it was difficult to fit in the car with the dog (too long to put across even in a fairly large SUV), and the dog didn't feel confident walking on the wobbly ramp. Steps are much safer. My only suggestion would be to make some sort of a cover for storing it because the edges and corners are a little sharp and getting it in and out of the car requires careful handling. Thank you for a great product. My lovely lab cross was having a double elbow op and I needed something that would make getting in and out of a 4x4 easier. I looked ramps (much cheaper) but this was perfect and she had no bother using it. Her recovery went well and for the time being she is back to her usual self. Its now ready for her when she gets that bit older...Can't recommend it highly enough.